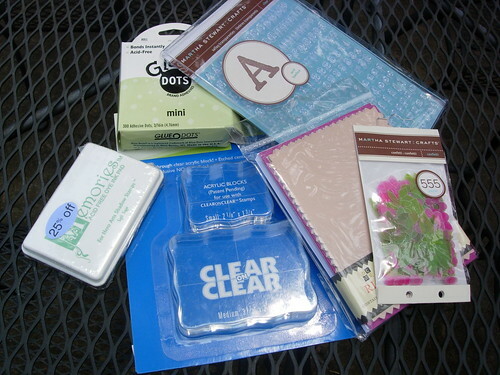 Craft sticky dots, new ink pad (which I don't like), Martha Stewart flower bits, Martha Stewart stamps, acrylic stamp block, and new cards. I've been wanting an alphabet stamp set for a long time, and I picked this one up at the new MS section at Michael's, thinking I could use my 40% off coupon. Boo on Michael's for not allowing coupons for MS goodies!!! I would buy so much of it. 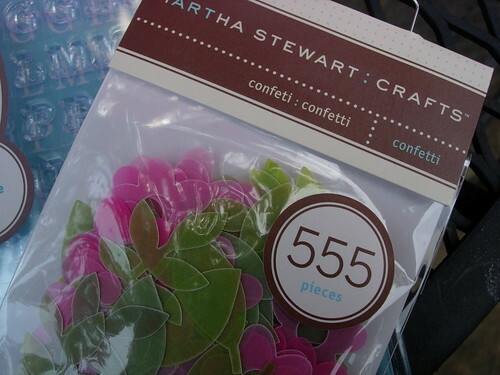 I considered the purchase for a solid quarter of an hour before deciding that I am worth it, and bought the stamp set and goodies to make cards. I made four. That is not a very efficient means of making cards, as the average cost is a whopping $10. 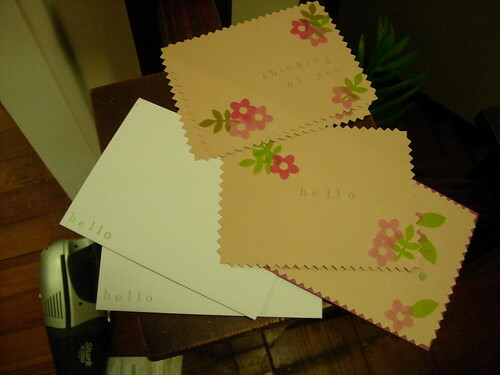 However, I made said cards while watching Casino Royale, so Daniel Craig made up for it.